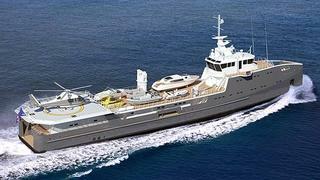 Dutch superyacht builder Amels has sold a second Damen-built Sea Axe 6711, a 67-metre Fast Yacht Support vessel, due for delivery in spring 2014. It will bear many similarities to the first in the series, Garçon, which made an impressive appearance in Monaco earlier in the year, although there are some striking differences too. This latest Sea Axe is being constructed with an extensive dive area, designed specifically for scuba diving expeditions. The platform is also being equipped with a LY2 certified helipad, with a maximum take-off load of 5,000kg and a D value (diameter) of 14. This makes the helipad sufficient to accommodate a Eurocopter Dauphin or Augusta Grand. The working deck will be equipped with a crane with a maximum working load of 6.6 tons at a reach of 16.6 metres. Put simply, the crane is strong enough to safely manoeuvre a large tender such as a 12 metre J Craft Torpedo weighing 11 tons.